Oh Olive, you look so dandy. Oh, I don’t know what is going on with that cute sweater on Olive, but I love it!!! You’re such a tease! I can’t wait to see Olive and her sweater in all their cuteness! Come on, show us more… please? BTW, what yarn is that? I love those colors. Love the yarn. It looks the like the Bubbles I used to make my sister an orange scarf. Olive, could you get cuter? And that yarn looks delicious! 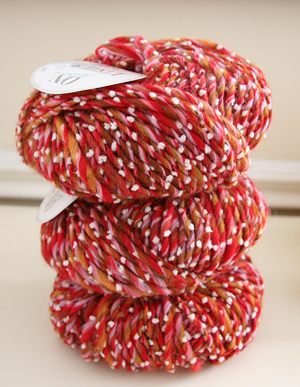 yarn is ONline Linie 97 and I have had a serious crush on it for over 2 years now and I finally bought myself some. hooray! wonderful yarn.. so bright and crip with these white spots.. 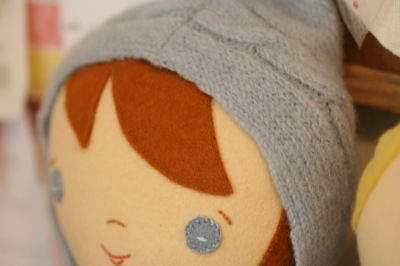 I love it.. enjoy your project..
That looks like extra fine knitting on the doll hoodie. But the other yarn looks really lovely too. Drooling over the yarn…ohhhh I love it! And the hoodie is cute too.